The Master of Advanced Studies in CAAD is a one-year program that is divided into a series of six independent modules. Each module is taught in seminar-style on a unique subject, and concludes with an individual or group project. Modules are approximately four to six weeks long. In addition to the seminar modules, students research a field of particular interest together with a selected mentor. At the beginning of the year, participants chose a mentor from among the researchers at the CAAD department. The research done with the support of the mentor usually culminates in the students' year-end thesis projects. Finally students conclude the year with a joint group project such as the construction of a pavilion. Please see the Exhibition section above for further images and descriptions of the modules. 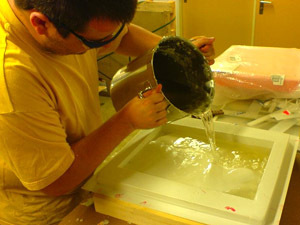 The work from the ongoing and the past year is documented on the MAS 2011/2012 blog and the MAS 2010/2011 blog. In addition the MAS modules, students are welcome to audit other courses in the architecture departments and they are to invited to visit presentations from guest lecturers. The Master of Advanced Studies program is taught by the researchers of CAAD Department as well as by visiting lecturers. The faculty is comprised of a very diverse set of international teachers and researchers, coming from background including architecture, product design, computer science, philosophy, literature, music, medicine, and economics. The MAS program takes place in the CAAD Department's facilities on ETH Hönggerberg campus. 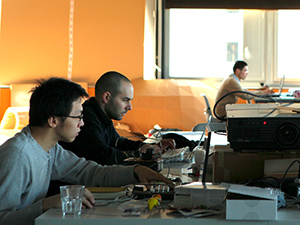 There is ample open office studio space, as well as lab space for experimentation. Students have access to the CAAD Department's 3D printer, it's high end workstations, as well as an excellent Cimbali espresso machine. Further, MAS students have full access to the Architecture Department's Rapid Architectural Prototyping Laboratory Raplab, complete with laser printers, vacuum formers, CNC machines, etc. 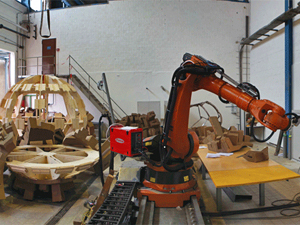 The CAAD Department further has a dedicated 500 square meter production facility for large scale experiments, complete with a robot arm and Zünd CNC plotter. Further information is available here.